Visumatic Industrial Products designs and builds the best automatic fastener feeding and driving equipment on the market to install screws, nuts, bolts, push pins, and specialty plastic fasteners. Visumatic components and systems are custom engineered for your parts and your business, and are designed, built and extensively tested in house. They deliver longer life cycles, extreme durability, pinpoint accuracy and the strongest guarantee in the business. Visumatic has over 40 years of engineering expertise providing specialty screwfeeding and driving automation equipment for manufacturing companies doing assembly work. Their on-call customer service ensure your line stays up and running. 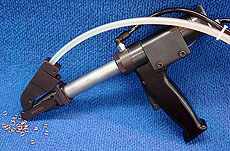 Handheld Systems: In-line or pistol gripped screwfeeders used by an operator to manually locate the driving position and automatically install the fastener. Machine Builder Component Systems: Modular building blocks for customers who are building a semi- or fully automatic assembly process. Drivers, feeders and hoppers with your choice of nosepiece, driver type and controls. You build with their components. 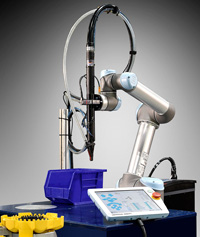 Fixed Systems and Robotics: Turnkey assembly systems delivered to the customer ready to ‘plug in to run’, completely designed to your specifications and parts. Custom engineered solutions for your operators - all designed and built in house. 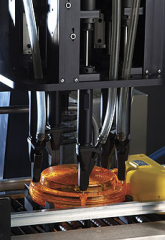 Visumatic’s proven and established capabilities make them the single source for innovative automation equipment. Their 100% Guarantee: All of their systems are 100% guaranteed with a six-month unconditional guarantee, and lifetime customer service support. Customized For Your Part: Every Visumatic driver is custom engineered to fit your part and application. Not the other way around. More Experienced: Visumatic’s team of engineers has over 80 years combined experience and their average employee tenure is nearly 13 years. On-call Support: Visumatic’s experienced support staff is always available and can be on site within 24 hours. Fast Delivery: Most applications can be delivered in about three weeks – almost half the time of most other suppliers. Extensive Testing: Their systems are exhaustively tested before shipping to ensure long run cycles, decrease down time and deliver low cost of ownership. High Repeat Business: Visumatic's customer satisfaction is so high that over 80% of their business comes from repeat customers. Their broad range of expertise enables them to provide solutions for any automated assembly fastening challenge. Visumatic Industrial Products is an independent, family-owned and operated business centrally located in Lexington, Kentucky. The Visumatic VCM-3X.2 cobot fastener feed and drive end effector package adds advanced capability to collaborative workspace projects.